One of the worst scenarios that can happen to you is stepping out of an establishment and discovering that your bike is already gone. Bike theft is a common problem in Australia. Around $3.9M worth of bikes were stolen from 2013 to 2014. The only line of defence against thieves is the bike lock. If you’re planning to regularly use your bike and leave it alongside the street, you need to secure it properly. If you fail to lock it correctly, your bike will still be stolen. Here’s a short guide on how to pick the right bike lock for you. 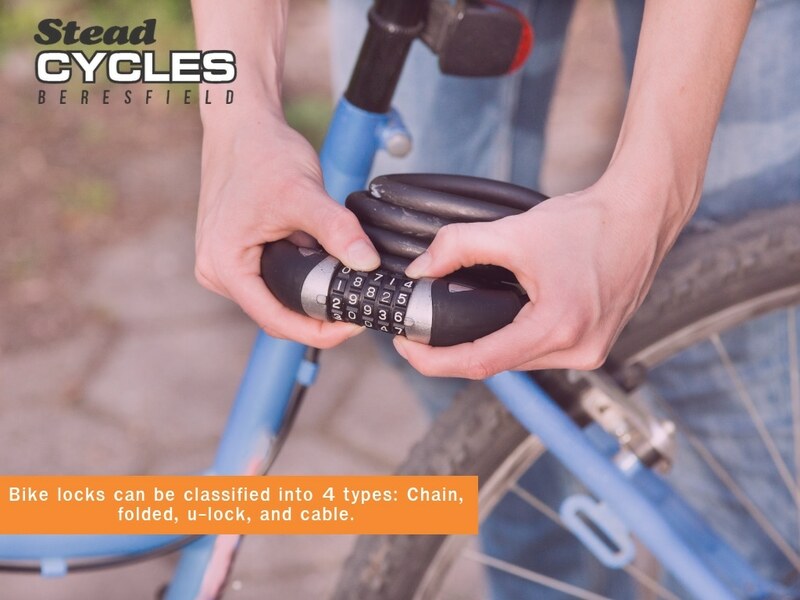 Bike locks can be classified into 4 types: Chain, folded, u-lock, and cable. Each group offers different levels of security, ease of use, versatility, and transport. You need to consider the amount of security you need in the area, how easy it is to use, and if you need to bring it along with you. Some security mechanisms use a combination of these groups. Locks that belong to this group are made out of hardened steel moulded into a U shape. They are normally covered with plastic or rubber to protect your bike’s paint. This also reduces the rattling that you hear when you are riding your bike. The two ends of the shackle connect to a crossbar which serves as the locking mechanism. This closes the U into a D.
Modern U-locks employ a dual locking system so the ends remain tightly locked even if the U is cut by a portable angle grinder. It will take an expert thief equipped with sophisticated tools in order to deal with this type of bike lock. Cheaper brands and versions have a ‘bent foot’ shackle. It takes only one cut before they are opened apart. This type is made out of steel chain with a plastic sheath to protect the paint of your bike. A padlock connects the ends. The level of security of this group depends on the quality of the padlock and thickness of the chain. A high quality padlock, chain made out of hardened steel, and tiny gaps between the links make the chain hard to break. Chains have a big diameter and are quite flexible. They are easier to secure in immovable structures. Unfortunately, they are bulkier than other types of bike lock. Folding locks have the most unique design among all groups. They consist of multiple steel bars connected by rivets that permit them to pivot independently. This mechanism gives more flexibility than the rigid U-lock. They are quite useful when you’re securing your bike to an abnormally-shaped structure. These locks are easy to transport because they are much lighter than the U-locks and chains. They can also be folded into a compact size. They will not consume too much space in your bag. However, the amount of security they provide is only from low to middle range. Locks in this group are made out of braided or twisted steel. They can be coated with plastic or rubber. The ends are either connected in a lock or with hinges while the other cable ends are firmly secured inside the lock. The locks in this group may also vary depending on the lock strength and cable thickness. Experts rarely recommend this type of bike locks because they are easy to cut with simple and cheap tools. You can’t use this type of lock if you plan to leave your bike overnight unless the area you’re in is already safe. If you encounter a wild bear when you’re out in the woods with a friend, always remember that you only need to outrun your friend, not the bear. In the same way, you can never fully secure your bicycle. However, you can make it the least accessible target of a thief in your neighbourhood. These cables can be cut so easily it’s not worth the risk. In addition to being more portable, a smaller u-lock provides a thief less chance of being able to execute a leverage-based attack on your lock. You’ll never be able to protect all parts of your bike with just one u-lock. You need additional locking mechanisms such as a cable lock, locking skewers, or another u-lock. Don’t take this advice too literally. You still need to maintain your bike and take care of it! For instance, you can out a hole in the seat and cover it up with electrical tape. The seat will then have no more value to a thief because it’s already damaged. You can also just simply place a tape on the seat to drive away thieves from taking it. If you’re staying in a big metropolitan area, college town, or city, you need to get a U-lock or chain with a high-quality padlock. If you reside in a rural area and occasionally travel to cities from time to time, get a lock that can protect you from the highest level of crime. How much should I invest in a bike lock? Many people abide by the 10% rule when buying their bike locks. This means that you spend 10% of you bike’s worth on a proper bike lock. Some lock manufacturers provide insurance that reimburses customers in the event of theft. Just make sure that you understand all of the provisions to check if it’s not a rip-off. This is acceptable as long as it abides by the tips given above. 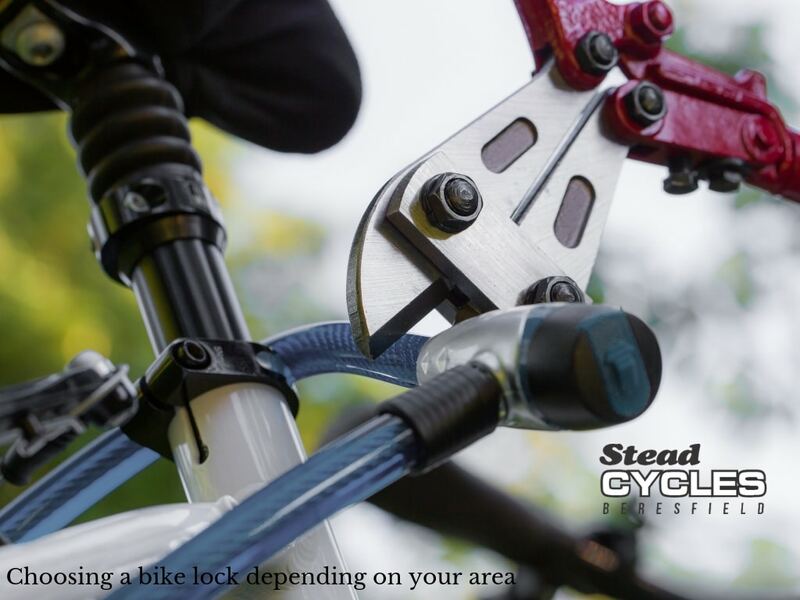 Get high quality bike locks from Stead Cycles now! Bike locks are highly essential when it comes to securing your bike. Make sure that you buy them from trusted companies only. Consult our team at Stead Cycles today. 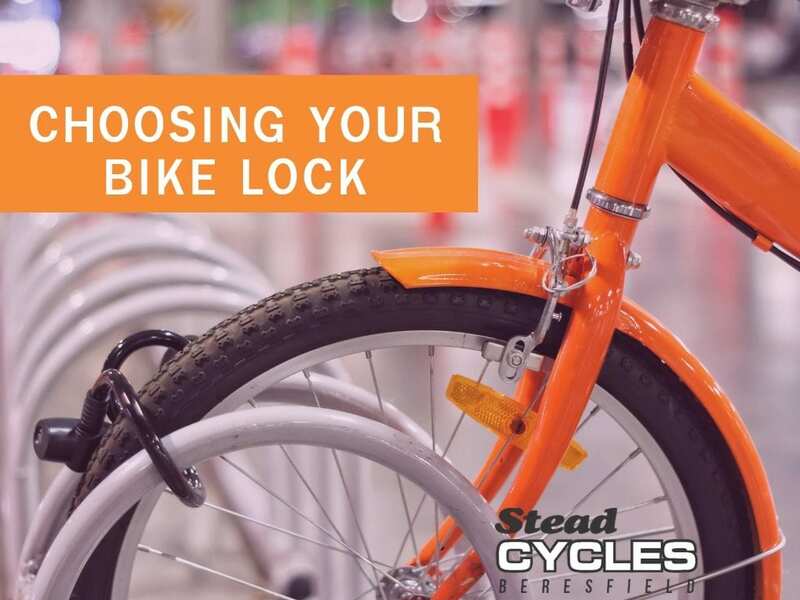 We’ll help you choose a suitable bike lock for your needs.